Six months after the Hamden tornado severely damaged the roof of the Dickerman House, restoration is underway. During a Hamden Legislative Council meeting last month, the council waived a $2,707 permit fee in cooperation with community efforts to restore damage left from by devastating tornado on May 15. The storm knocked over trees which demolished building structures throughout Connecticut, including several houses in the northern Hamden area. The Dickerman House was no exception. A fallen tree in the front yard tore through the middle of the roof, punching a gap in the structure and creating residual damages along the siding. 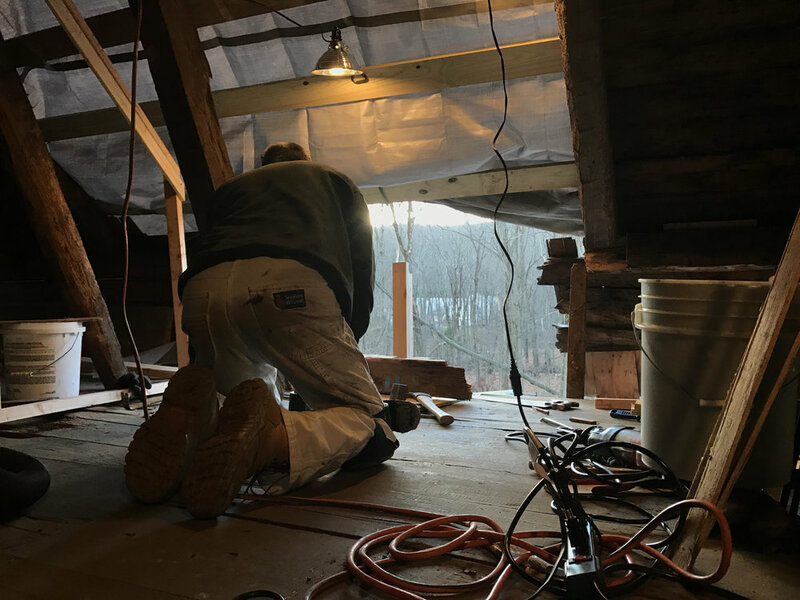 The roof structure was shattered in multiple different places, so roofer and longtime Historical Society member Bob Zoni is being paid to restore the roof by substituting a few wood beams as possible in order to to maintain the house’s historical distinction. Roofer Bob Zoni gathers his tools underneath a tarp where the house’s roof once was. Zoni conceived the restoration plan that passed by the Legislative Council two weeks ago. In his plan, Zoni said that he will repair the roof’s head beam section, the rafters, and the overhang using timber frame joinery and splicing techniques. Other minor repairs were also included in the plan. “It’s something I’ll be proud of in the end, but it’s very stressful,” said Zoni. “It’s almost like it’s my own house. In the driveway are stacks of lumber that Zoni plans on using to hold up recycled roof slates. He works under a tarp he propped-up, himself, as well as a lights that hang on a piece of wood in place of a roof beam. The main struggle of restoring the house, according to Zoni, is something out of his control. The exterior damage of the Cider Mill Barn. The Cider Mill Barn, which sits beside the house on the property, is also damaged. During the tornado, one of the barn’s sides detached from the rest of the structure, creating a massive gap. Wood beams keep the barn from completely toppling during high winds, but Zoni said that another heavy snowfall could cause the barely-standing structure to implode. Interior damage of the barn. “People who work outside live and die by the weather,” Zoni said. To his gratitude, forecasts for the remainder of this week show little signs of any substantial precipitation. The last time that Zoni said he saw a storm as disastrous was during the 1989 Northeastern US tornado outbreak, when 200 homes in Hamden took the brunt of the tornado’s impact. The New York Times reported that cars and industrial cranes were tossed through the air, and rows of houses, as well as an industrial park, were flattened. The Hamden Historical Society avoided damage during the 1989 tornado, but wasn’t as lucky this past May. “The Hamden Historical Society is attempting to restore these reminders of our town’s heritage, but to do so it needs to raise $25,000,” says the main page on the society’s website. Yet, the total cost of the restoration of both the house and the barn may be much greater, according to Zoni. He said that the entire restoration process may cost up to $200,000. The house dates back to the 18th century. Jonathan Dickerman built the farmhouse for his wife in 1792 and it became state property before the Great Depression. Ownership was then passed on to the Hamden Historical Society in 1961. The society remodeled the house to resemble as it did in the 18th century, which is a testament to the sound techniques of historical carpentry, according to Zoni. Had the Dickerman House been a modern, stick-framed house rather than a timber frame structure, the damages would have been more severe, according to Zoni. To a person unfamiliar with historic structures, the damage appears much worse than it actually is. It can be repaired by qualified people. A ladder leans on a wall beside an upstairs hallway window that peeks out unto Mount Carmel Ave. Zoni’s ladder and other work tools take up some of the space upstairs during construction.